Other Products: White cardstock. Beads String. Instructions: Card size 6" x 6" (final size). 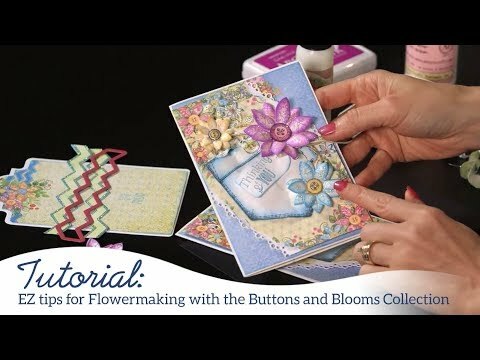 Take pattern paper from the Buttons and Blooms Collection and tear the edges and adhere it on the card base. Take one tag and distress the edges and then tear the edges and adhere it with foam tape. Cut decorative medallion die twice on white cardstock and adhere it as shown. Now stamp one pocket image from Patchwork Pocket and Patterns Cling Stamp Set with archival ink-jet black and cut it with coordinating die and color with archival ink-rose madder and adhere it with foam tape to give some dimension. Stamp sentiment on the pocket image with archival ink-jet black. Now stamp some flowers and buttons from Buttons and Blooms Cling Stamp Set with archival ink-plum and garden patina on white cardstock and cut them with coordinating die and color them with archival ink-sunshine, rose madder, cactus flower, garden patina (as shown). Then adhere two layers of petals to make one flower, add the button at the centre of the flower and then add some crystal clear glitter on the petals. Arrange the flowers on the card and add some bead strings as shown.